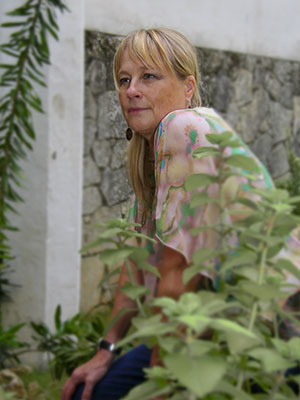 Sometimes referred to in print (lovingly or sarcastically) as Havana Jane because of her passion for Cuba and its musicians, one of the most tireless advocates on behalf of Cuban jazz and folkloric musicians in North America has been soprano saxophonist-flutist Jane Bunnett. Along with her equally focused husband trumpeter Larry Cramer, they’ve been an entry point and provided an introductory platform for such exceptional Cuban musicians as pianists Hilario Durán and David Virelles, drummers Dafnis Prieto and Pedrito Martinez, and saxophonist Yosvanny Terry. In fact, name a Cuban jazz artist who has arrived in North America over the last 20 years and you’d be hard-pressed to come up with any who have not in some positive way encountered or been directly assisted by Jane and Larry. And they’ve done so not as cultural tourists blessed with Canada’s more realistic and sensible travel opportunities to Cuba, they’ve done so as thoroughly immersed music humanitarians, always seeking the best and freshest Cuban improvisers, voices and folklorists to collaborate with. Theirs is never a quest for fusion, theirs is always a quest for uplifting Cuban artists and culture onto the world stage. Jane and Larry’s latest project is a recording and planned tour with the exciting sextet of Cuban women known as Maqueque (Ma-keh-keh). You can learn more about Maqueque by clicking on the following links: janebunnett.com | jazzglobalmedia.com/maqueque/. Jane is an old friend so clearly some questions were in order on the nature of this latest Cuban music immersion. WJ: Is this new project related to your 2009 Embracing Voices project, or a further development of those ideas? JB: This is a totally new touring group that comes out of mentoring some young women in Cuba.”Embracing Voices” was a Huge project… 18 musicians. We were very limited in our touring… We did do a cross Canada tour, but it was very costly. This is my first new touring group in many years. I intend to pursue this for the next few years and add female guest artists into the mix in different regions. What’s the instrumentation for this Maqueque project? The instrumentation is; myself on flutes and soprano sax; piano, bass and tres guitar, drum set, batás and congas and lead vocals. The tres player is a strong vocalist, along with the conga player and pianist, both have distinct voices. There being often 4 voices in the mix! So we are a 6 piece group. Given your largely instrumental history, talk about your engagement with Cuban voices. You’ve mentioned the difficulties you’ve had securing this opportunity for these Cuban artists, but some may look at you as a Canadian artist with loads of experiences in Cuba and with bringing Cuban artists to Canada and figure the fact that Canada does not have a near-50 year “embargo” on Cuba the way the U.S. does and think this is not such a big problem for you. Please detail what it has taken you to make this happen. It’s not easy. Going back to 1988 in Havana Cuba we began to discuss with our dear friends Merceditas Valdéz (the great vocalist) and her husband Guillermo Barreto (legendary drummer) the idea for making a recording there together. That took a good 2 years to make happen; not only to get the money but to cut through all the red tape in Cuba as foreigners were not permitted in the recording studios… I think we might have been the first after the revolution. Also Yoruba Andabo were registered as dock workers, not as musicians, so they were prohibited also. That took a long time to work out. We received a Juno award for the disc and that summer 1991 decided to bring the project to perform the music at Toronto’s harbourfront. That was done with their assistance as they had the infrastructure to do all that! ; 18 musicians and I don’t think we knew all the work involved in that. It was amazing the number of cars that had US license plates in the streets… so many people came from south of the border to hear Cuban music. The project was called “Spirits of Havana” and we kept that name and established our working group. We continued to work and add many new (young and elders) into the mix of “Spirits of Havana” and then we received an invitation from Bill Martinez to perform at a conference in Berkeley along with Nancy Morejon and Alice Walker… this was our first night playing this stuff as Hilario Durán and [conguero] Pancho Quinto were denied their visas. When working on this visa stuff, there are 3 layers of departments in Cuba you have to work with: 1. Their artist agency 2. The institute of music 3. The ministry of culture. At the same time you must be working the application for the Canadian Embassy and the US interest section… it is a really fine balance of all these things and if a passport gets locked up, things stall… yikes! All of this has to be done months in advance. The costs can really add up. Back in the hellish days of Helms Burton we had our record deal canceled with Sony and 4 major dates in the US canceled because of the witch hunt that Washington proposed to various Arts funding organizations if they had Cuban nationals… that bill had nothing to do with arts and sports! Anyway we gave our word to the musicians and re-routed our tour in Canada with all 13 musicians staying in our home. The US is still a better market in terms of the costs to tour there because Canada is soooo big and you really only have 1 major city in each province… so you have to fly. We called that tour “Come Helms or Highwater” A real drag is once we get the visas… being in Canada we are only allowed to go to the US 2 times so we cannot just go there for one date… a bit of a catch 22.